Hello, hello. How lovely to see you. I do hope you're well this sunny Shrove Tuesday. I am not the biggest fan of pancakes. When we were children, Mum used to make us a thick dinner plate-sized pancake each and, my goodness, I did have to wade through mine and nearly always felt slightly sick afterwards! D is definitely in charge of any pancake making in this house and even has his very own crepe pan for the job. He makes beautifully light lacy pancakes but they are always very, very round. I mean, spookily round - they give me the heebie jeebies. His omelettes are exactly the same. 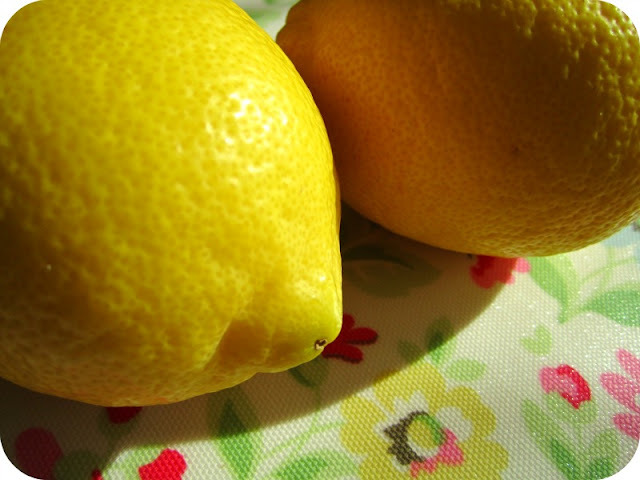 Anyway, I've been out this morning and bought a couple of big fat lemons which is my contribution to pancake proceedings! 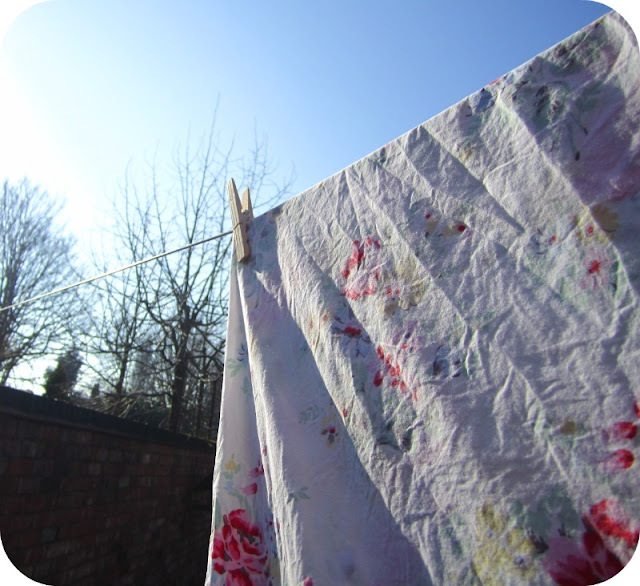 I was a domestic goddess yesterday; cleaning, tidying and washing like a mad thing. Today, I feel much more like pottering and bitting-and-bobbing. 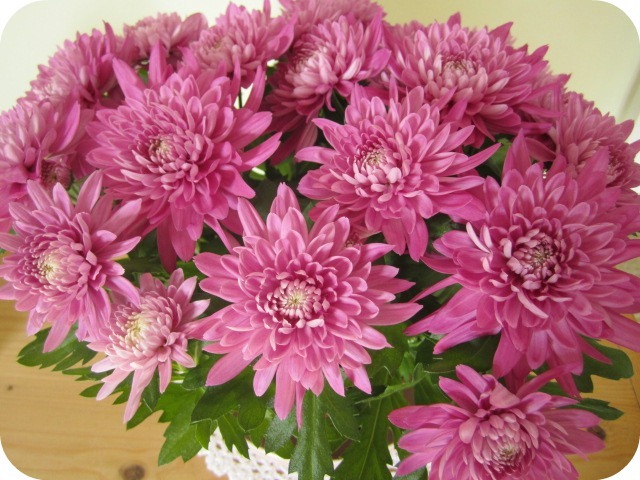 I wandered out this morning for a browse around the local shops, treating myself to a plummy chrysanthemum and some daffodils. 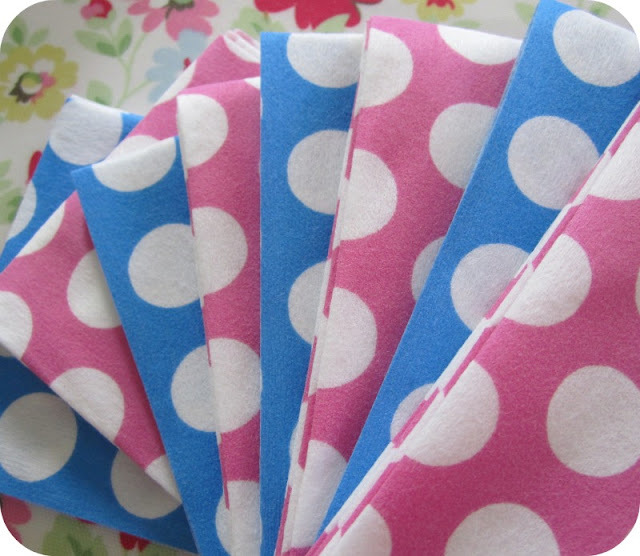 Well, I only have an hour before I collect the Blondies from school which gives me just enough time to cut these Sarah Smith cloths up into triangles for some garden bunting; an idea which I've seen a couple of times in Blogland. One of the many reasons I so love blogging, it's like a bottomless pit of ideas and inspiration. ﻿Enjoy the rest of your day. Ooh I love the colour of that trellis! I nominated MrVV as chief pancake maker - I am hopeless at doing them. He did ok - they remained sort of round(ish). 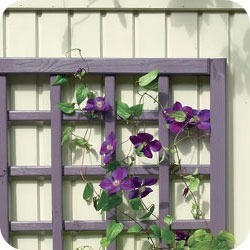 Yes Yes yes to the trellis colour. Much better than boring brown. oooh lovely bright pictures! I love the Sarah Smith stuff, I see it in Waitrose AND her stuff is always in Poundland too!! You're right - there's always lots of inspiration in blogland. 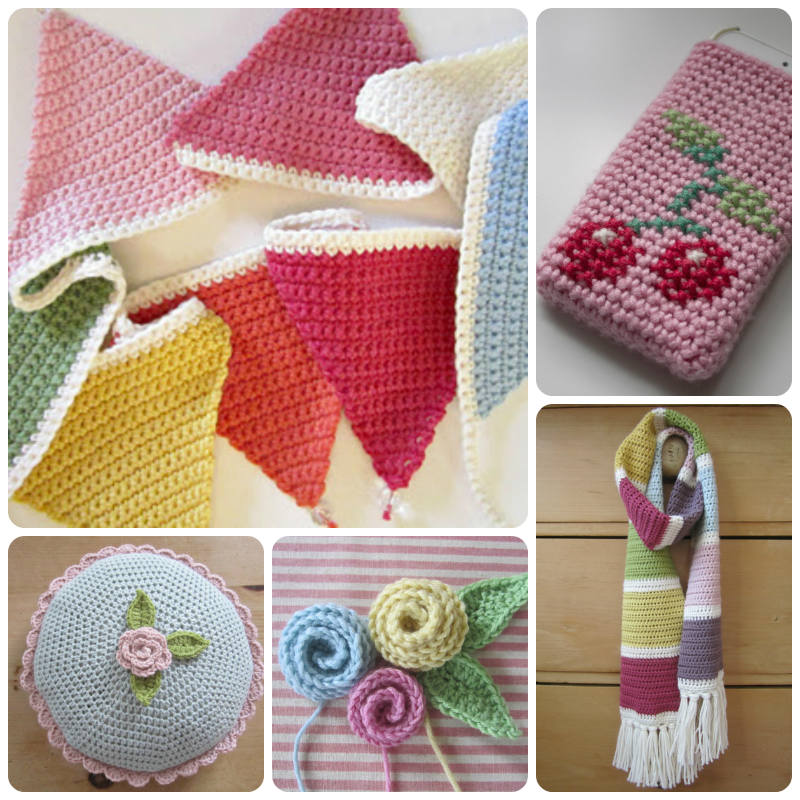 Great idea using the Sarah Smith cloths! I loved all your pix today! The lemons are so bright and beautiful, and I really love the colour of the trellis and clematis. Have a lovely spring-y week. I love that image of you in your garden - roll on the summer! I haven't seen those clothes in the spotty design - must look out for those! It must be to do with your Bonny Heather name that you want purple, don't you think?